Developing green economy cooperation will top the agenda at the first official meeting of environment ministers of the BRICS countries in Moscow on April 22. 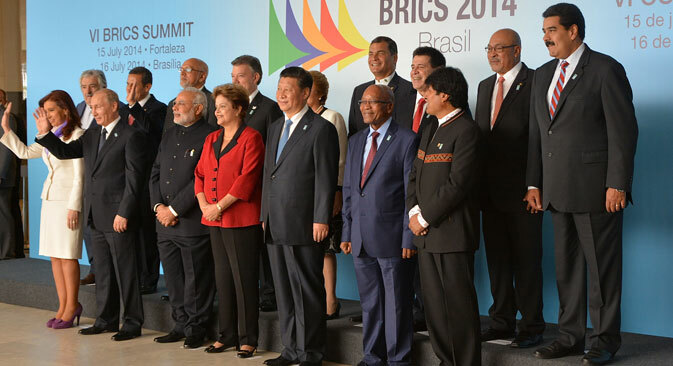 Green economy is the new mantra for the BRICS grouping of emerging countries. Promoting a public-private partnership platform for the implementation of green technologies, including through the BRICS Development Bank, will figure high on the agenda at the upcoming meeting of the Ministers of Natural Resources of the BRICS countries in April, according to the files of Ministry of Natural Resources available with RIA Novosti. “We want to offer the BRICS countries to consider the possibility of creating a platform of public-private partnership of BRICS aimed at sharing experiences of legislative regulation in the field of environmental protection, as well as in the area of searching for, exchanging and implementing the green technologies,” the Ministry of Environment has informed. The first official meeting of environment ministers of BRICS will be held in Moscow on April 22. The topic selected for the meeting is the development of green economy in order to ensure the sustainability and competitiveness of the BRICS countries. According to the ministry, Russia has a positive experience in this field - the successful operation of the St. Petersburg Initiative, the platform of public-private partnership of the Baltic region countries. The idea of establishment of the financial mechanism on the basis of BRICS Development Bank to facilitate the investment in green technologies and related environmental projects in the member states of BRICS is also being considered, the ministry has disclosed. In addition, at the April meeting the Ministry of Environment plans to propose the creation of a permanent working group at the level of Heads of International Departments on the priority areas of cooperation in the field of environment. The ministry has also prepared a draft of the concluding document of the ministerial meeting, which will reflect the main priorities relevant to all the BRICS countries. Currently, there are negotiations going on over the strategies of BRICS Countries Economic Cooperation project, which advocates supporting sustainable development, inclusive growth and development of the green economy. This can be achieved only by observing the principle of three components: social and economic development, as well as environmental protection, say the files. Russia holds the rotating presidency of the BRICS in 2015. The summit meeting of this grouping of five emerging countries - Brazil, Russia, China, India and South Africa - will be held in the Russian city Ufa this summer.